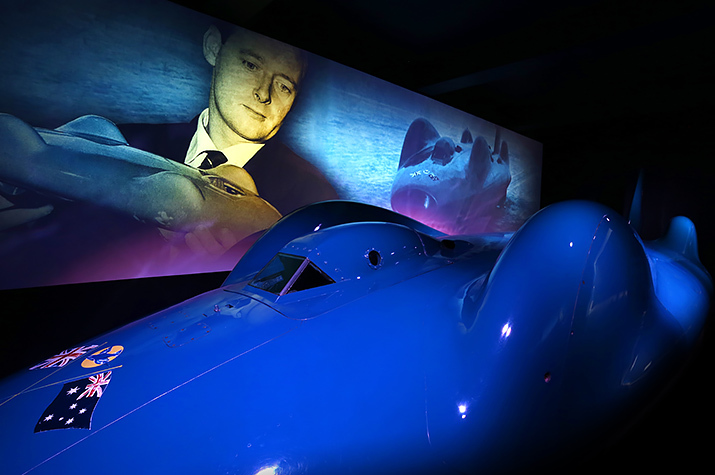 For Britain & For The Hell Of It – The Story of British Land Speed Records is told at the National Motor Museum, Beaulieu, on the 50th anniversary of Donald Campbell’s Bluebird CN7 record. Visitors are immersed in the tension and excitement of the thrilling and often dangerous attempts on the British Land Speed Record. Six projectors are used to fill two facing walls with video, whilst a moving narrative set to music provides the audio. The show is timed, with two ‘intermission’ pieces and keeping the space ‘alive’ between shows. D J Willrich Ltd, under the creative direction of Graham English & Co, filmed new footage of all four cars featured in the film using a 4K camera, out of black, in a custom-built studio environment. DJW then used this new footage as the focal point of the production, and, augmented with archive footage and stills, turned the material into an 11 minute show. 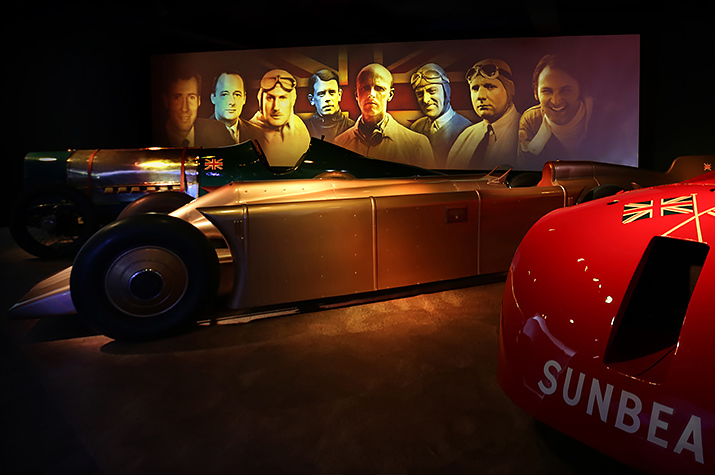 The actual vehicles themselves are highlighted with a full lighting sequence integrated with the video and audio. DJW re-used equipment from a previous immersive at the museum, also produced by DJW, to create this show, something that made good economic sense for the museum. 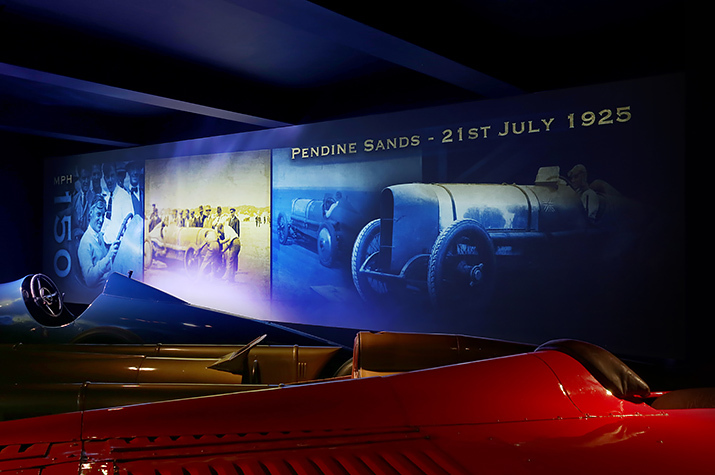 The Land Speed Record Story is the latest in a series of immersive shows that DJW has developed in conjunction with Beaulieu, continuing a long-standing relationship. The land speed record attempt vehicles are all lit while the ‘intermission’ show plays. DJW built the archive images into a show, and lights the vehicles when they are featuring. 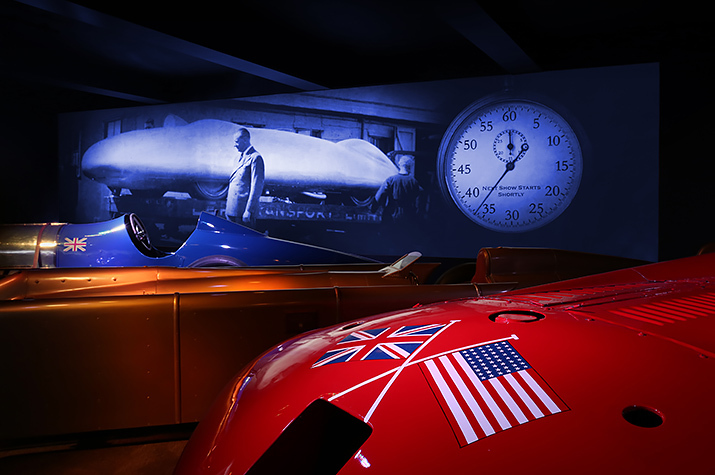 Two sets of three projectors blend together to create images that immerse visitors in the stories of attempting the Land Speed Record.